The Abel Tasman National Park’s crystal clear waters and golden-sand beaches are set against a backdrop of lush native rainforest. 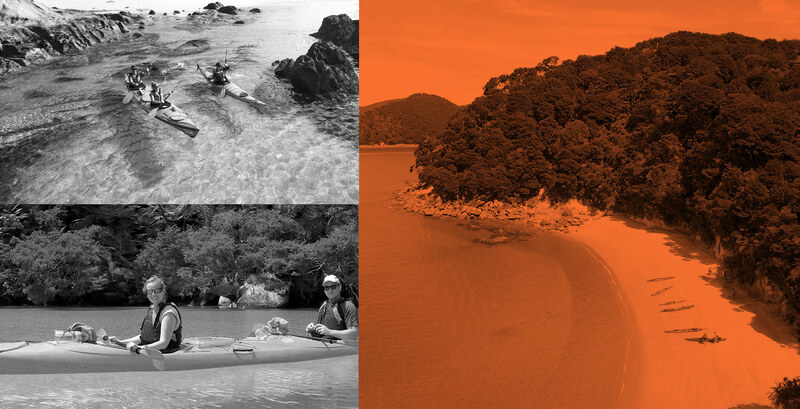 All of these elements combine to make the Abel Tasman New Zealand’s premiere location for sea kayaking. Marahau Sea Kayaks has a full range of half-day, full-day and multi-day trip options. Whether you choose to join a guided or unguided trip, we’ve got the best combinations of kayaking, walking, water taxi transfers and accommodation options to suit you. There are two basic kayaking options; freedom rentals and guided kayaking trips. Guided trips allow you to tap into the local knowledge of an experienced guide and expert kayak instructor. Freedom rentals provide you with the option to paddle into the Park under your own steam and according to your own schedule. Our base is located smack-bang in the middle of the Abel Tasman Village. Not only are we the closest to the Marahau Beach from where all trips in the Abel Tasman begin but we’re also on the same site as our water taxi base, general store and waterfront cafe and beer garden. Just to round things off, we’ve got accomodation on site too with the Marahau Beach Camp right across the road! Constructed in 2018, our brand-spanking new kayak base is a thing of beauty. We haven’t cut any corners with our kayaking gear either. We use only modern touring kayaks and premium quality soft-gear, all of which is well maintained. MSK’s Operations Manager, Anton Mudgway, is a force of nature. His enthusiasm for the Abel Tasman and sea kayaking is obvious in everything he does. Anton and his 2IC, Gwynn Rees take great pride in their team of experienced local guides. 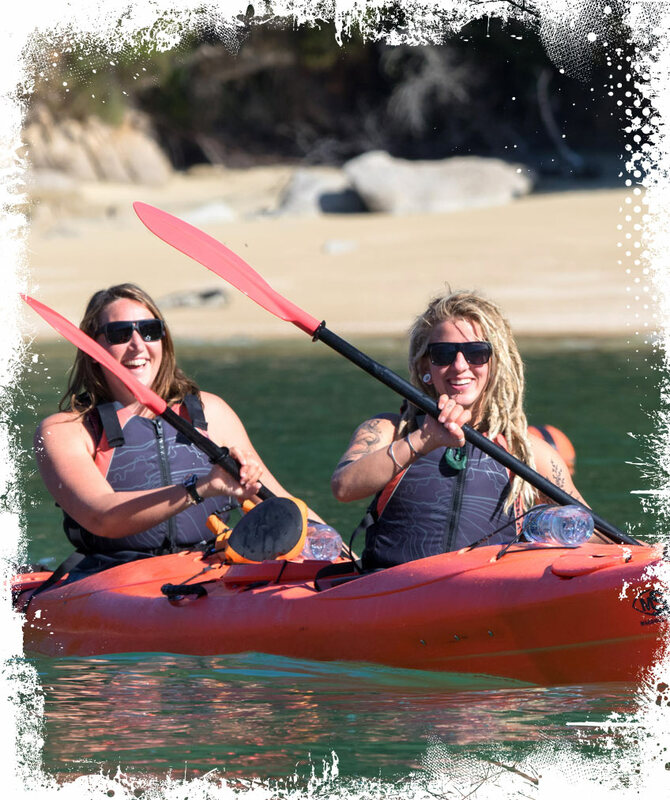 Freedom kayak rentals are a great, casual way to explore the Abel Tasman’s amazing coastline at your own pace. You rent a double person touring kayak, which also includes all of the safety gear you’ll need for your trip. One of our expert kayak instructors will provide you and your paddling partner with a briefing on how to use the kayak and other equipment so you stay safe and comfortable on the water. Your instructor will also give advice on how to get the most out of your Abel Tasman adventure. Freedom kayak rentals are available for anything from one to five days. Joining a guided trip is the perfect way to hang out with a local for the day. Our guides absolutely love showing off their little slice of paradise and to share their knowledge of the Park’s history, flora and fauna. We have a range of half-day and full-day guided trips to suit your specific interests and your taste for adventure. All of our full-day guided trips are fully catered; including snacks, hot and cold drinks and a delicious Kiwi-style picnic lunch. Many of the truly magical moments in the Abel Tasman happen when you’re camping beside the beach. The sunsets and sunrises are incredible and there is a sense of peace and tranquillity from camping in the great outdoors that’s hard to put into words. MSK has a great range of multi-day package trips that include a mix of freedom and guided kayaking, walking and a truly incredible fully-guided, fully-catered overnight trip option. Don’t have your own Transport? Don’t worry, MSK runs a shuttle bus between Nelson, Motueka and Marahau. Just choose the shuttle bus pick up option when you’re booking your trip!